For privacy, Remembary stores your diary information locally on your device. However, if you need to get data out of the app, you’ve always been able to export files either as plain text or in a re-importable “data” format. Getting these backup files out and back into Remembary has always been kind of awkward. DropBox integration depended on their unstable SDK libraries and sometimes failed, while I was never able to get direct integration with iCloud Document Library to work properly (and it turns out many other app developers have experienced the same problems). Remembary 3.2 has solved all of these export/import problems by implementing iOS’s “Share Sheets” technology. This lets you export your backups to any storage system on your device, and re-import them from any location, including DropBox, iOS’s “Files” app, and even email attachments! To import, find the file you want to use, and bring up the “Share” option. Each service has a slightly different way to get to this, but often tapping and holding on the file will give you a menu with a “Share” or “Export” option. 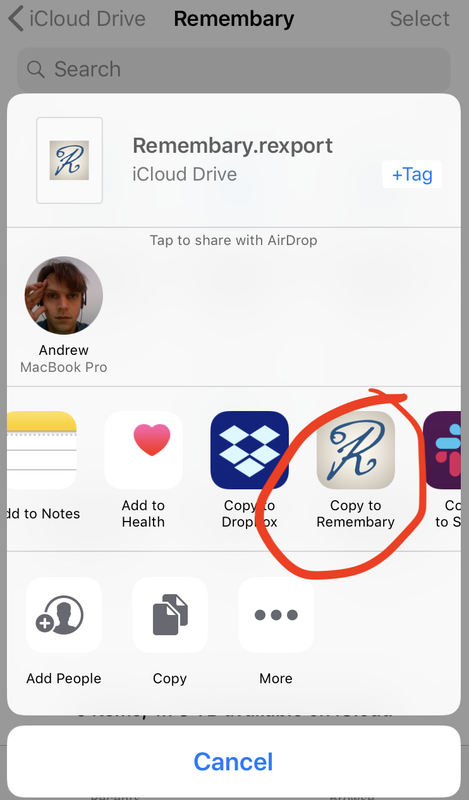 This will bring up another Share Sheet, and one of the options should be “Copy to Remembary”. Remembary will then pick up the file and import everything from it. You can track the progress through a status message at the bottom of the screen. For this to work properly, Remembary’s data export files have to have a datatype suffix of “.rexport”. If you made older backups from earlier versions of Remembary, they have the “.xml” suffix. To get them to work with the new Remembary, you just need to rename the files and replace “.xml” with “.rexport”. What’s new in Remembary 3.2. New themes and fonts, better integrations, and share sheets! Update from 2016-09-21: The Facebook problems have been fixed. Thanks to everyone for the feedback and the testing help. (If you're interested in all the ugly details, there's a detailed technical blog post on the Shindigital website). 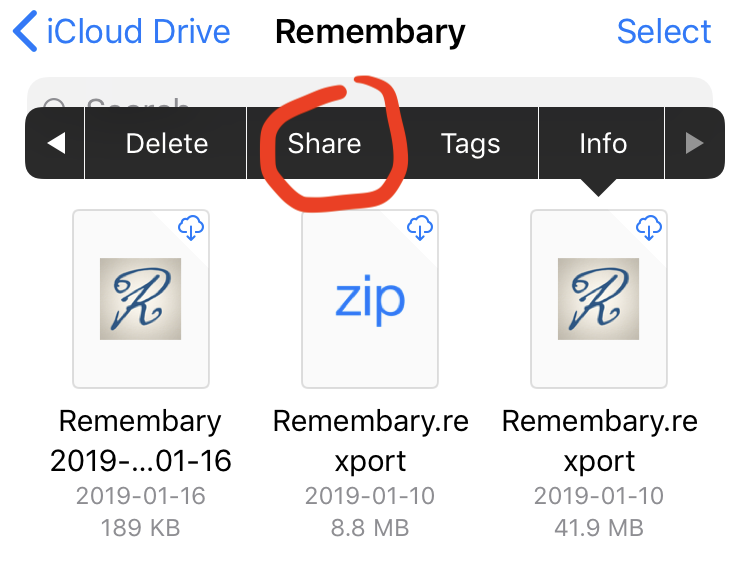 The all-new Remembary 3 has been out for almost a month now, and while the feedback has been generally positive, a number of people have reported problems getting the app to connect to Facebook properly. I am working hard on fixing this problem, and hope to have an update out some time in September. What has made fixing this problem extra difficult is that the Facebook connection only fails for some users, and not for me or any test users I've been able to set up. If you're having trouble connecting Remembary to Facebook, please get in touch with me - the more examples I can collect, the easier it will be for me to figure out what's going on. I'm also building a group of testers who can help me make sure everything work properly. Please let me know if you'd like to be on this testing team - you'll not only help me fix these kinds of problems, but you'll also get new versions of Remembary a little bit earlier than everyone else! There are many reasons to keep a daily journal: a private place for your thoughts, a wayto reflect on each day, a place for your future self to see what you were doing in the past, and even just great daily writing practice. But many people have trouble starting a diary, and even more trouble keeping the daily habit. I’ve managed to keep a diary for almost a decade - and while it hasn’t always been easy, I’ve learned a whole lot. I put all of these lessons I’ve learned into my iOS diary app Remembary. Here are some tips for getting into and keeping the diary-writing habit, and how you can use Remembary to get the most out of them. You don't need Remembary or even an iOS device for them to be handy, but I've included notes on how Remembary can help in each case. If you like what you see, you can buy Remembary on the iOS App Store. Any habit will be difficult to start and maintain if it's hard to do. Some people try to write only at a special desk, only in a special book, and with a special pen. This can be great for "getting in the mood" but it can lead to trouble if you're on a trip, or you've misplaced your special book or pen. 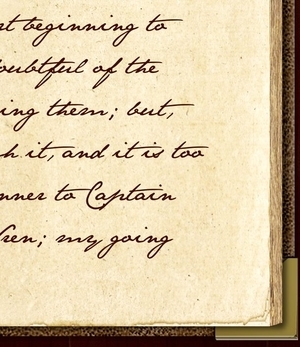 Also, in these digital days, writing quickly and legibly with a pen is becoming a lost art. It's much better if you can get things written down quickly, any time and any where. Do you have some time on the bus or in a waiting room? If you have your diary with you, you can quickly write something down. 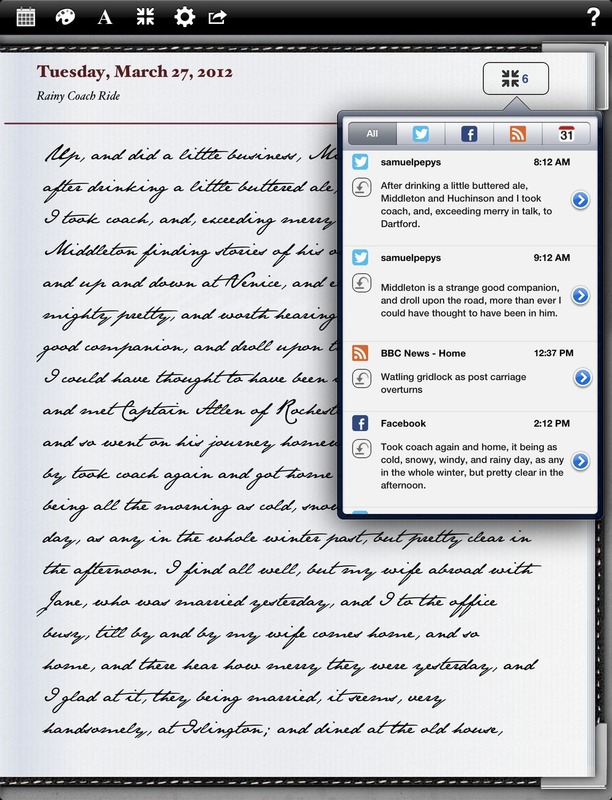 Remembary lets you write your diary anywhere you have your iPhone, iPad, or iPod Touch. If you're on the road and have left your iPad at home, you can write on your iPhone and then transfer your entries back afterwards through DropBox or iTunes. 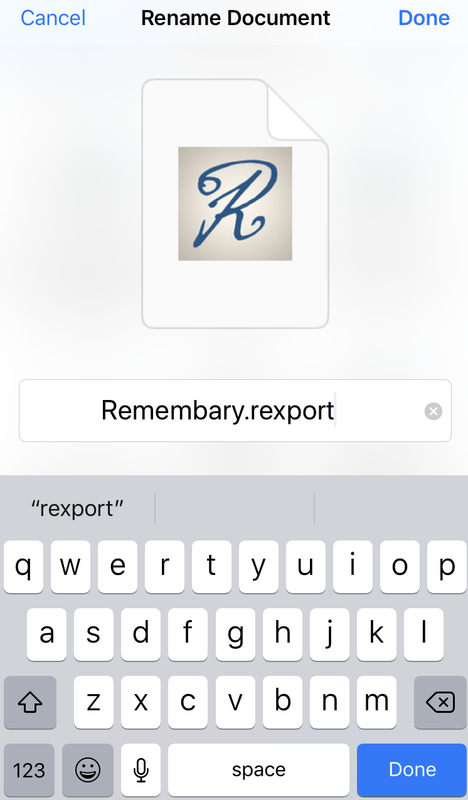 Remembary lets you type on the screen or with an external keyboard - if you're using more recent iOS devices, you can even dictate your entries with voice recognition. If you still like the look of handwritten diaries in handsome books, it has a dozen retina-grade themes and a wide choice of fonts, including Renaissance calligraphy and even a recreation of Jane Austen's handwriting. With all the social media and online forms of expression available these days, we are in a golden age of writing about ourselves - but all of this writing is done in public. In a world of Facebook, Twitter, and blogs, it's still important to have a place to write exclusively for an audience of one: your own self. When you're writing in your journal, it's important to just write whatever you feel like, without worrying about who might be reading. Simply writing 100% honestly about your feelings or your ideas can help you work through them - and that's much more difficult if you're worried about who might be reading. Make your diary your own, for yourself only. If you still like sharing your thoughts online, or are working on a memoir for when you become famous, consider your private diary to be a rough draft, but still keep it for your eyes only. 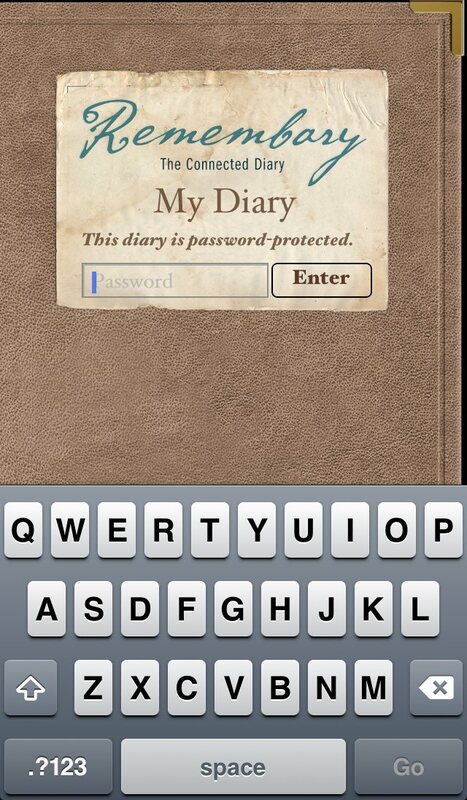 Remembary can be secured with a password, making sure that nobody else can see your diary. If you also lock your device with a passcode and also encrypt your backups, your digital diary is almost impossible to break into - certainly much safer than any physical one with a built-in lock. Keeping a daily journal is, obviously, one of those habits that requires daily effort. Starting and keeping a daily habit can be very difficult, especially these days when so much in our lives is chaotic and unstructured. One strategy that works really well for building daily habits is the "Seinfeld Calendar" where you mark each day when you've done your task and try to build as long a chain of days as possible. This gives extra weight to each day: you're not just missing a single day, but instead you could be breaking a chain of several weeks. 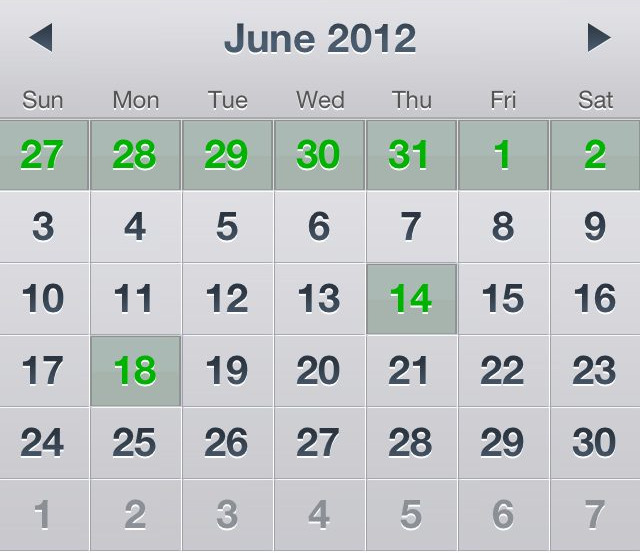 Any page-a-day diary will let you quickly see which days you've missed, but Remembary also has a calendar view that shows days with entries in green and days without entries in grey. This lets you see at a glance where you have gaps, and how long a "Seinfeld Chain" you've been able to build. If you have missed a few days in your journal, don't worry - and certainly don't give up! Just fill in the gaps as best you can as soon as you can. Even a short diary entry is better than nothing, and the longer a day stays empty, the harder it is to remember what happened. These days, though, we have so many extra ways to remember what happened each day. Twitter, Facebook, blogs - all show what we were doing and thinking, timed to the minute. Every photo or video you take these days is likely to be timestamped to the second. Pictures and postings made from your phone are frequently geotagged, so you can even see where you were doing things, as well as when. Even if you're writing out your diary on paper, you should use your computer or phone to help remember what you did every day. It's easy enough to forget just what happened in the morning, let alone several days earlier. This is the feature that makes Remembary special: it's the only diary app that stores your life on your device. It automatically fetches your Facebook and Twitter feeds and lists your postings by day and time. It also automatically searches your photo library and even your Photo Stream to show you every picture you took each day. It even makes an instant map out of any geotagged pictures or tweets or Facebook checkins. The latest version also shows calendar events for each day too. If you're in a rush, you can even fill in a quick overview of your day by tapping on tweets or status updates or events to copy the text directly into your diary, complete with a timestamp. Some people who still like to write their diaries on paper still use Remembary just for the way that it collects all of the feeds in one place and helps them remember their days. While writing in a diary can be good for your mental health today, the greater value comes after you've been writing for a while and you can look back on what you've written earlier. Journal entries are like a letter to your future self, and reading back on your past is a great way to get perspective on your life. Living your life in real time day by day, it's easy to get distracted by details and busy-work. Reading through several weeks, months, or years of a diary can help you see bigger patterns in your life and behaviour and emotions. What did you find important? How did your thoughts about people or things change over the years? How different was your day-to-day life? How have you changed? Even if you're just starting the journal-writing habit, it's enlightening even just to look back on what you were doing and thinking a month or even a week ago. Understanding how valuable what you write today will be to your future self is an extra motivation to keep writing every day. I've put almost a decade of diary entries in my own copy of Remembary, and I've included many ways to browse through them. The calendar display lets you jump around by month, but also includes buttons for quickly jumping to the exact same day one year in the past or in the future. It's fascinating to compare what I was doing on the same day every year, and Remembary makes it easy to do so. I also recently added a "Random" button, which jumps me to a random entry somewhere in my life - I like to cover the date and try to guess when it was written (or at least figure out the correct year!). Remembary also has a scrollable, categorized list of all entries, including brief summaries of each day - just swiping through this can give a quick view of the big events in your life. You can also search in this list by any text that's in the diary or in the related feeds. You can even just type in parts of dates to see, for example, what you were doing every Friday. While your diary should be private, your writing habit doesn't have to be. Get started writing with a friend and encourage each other to write. You can also get automated help: set an alarm or reminder to get you to write every day. For Remembary, I set up a diary tips email plan to help you get started with diary-writing. Enter your email on the sign up page, and you'll get daily emails for a week, followed by several weekly reminders. These emails will give you extra tips for getting started with the diary-writing habit, regardless of whether you're using Remembary, another app, or writing on paper. Also please note that your address will only be used for diary tips - it won't be used for anything else or sold or transferred anywhere). Hope you find these tips useful. Let me know what you think. To find out more about Remembary, take a look at the video below and explore the rest of this site and blog. 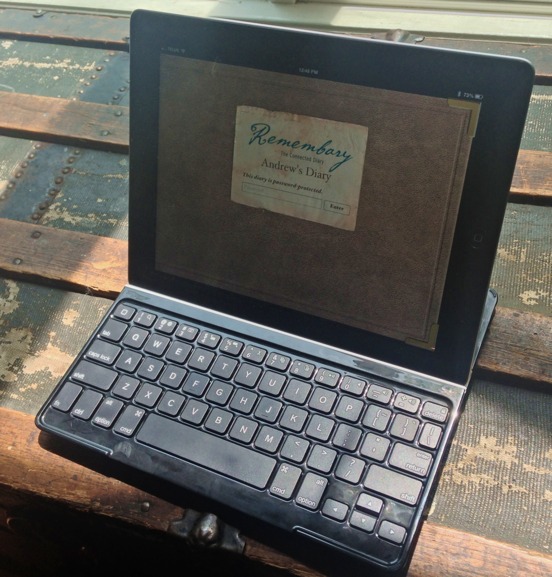 You can also buy Remembary from the App Store - for a fraction of the cost of a paper diary.